На главную / Справочные материалы / Наращивание вируса болезни Ньюкасла на микрочастицах Cytodex 1 Microcarriers в Биореакторе Infors, англ.яз. Copyright © 2010 Mohd Azmir Arifin et al. This is an open access article distributed under the Creative Commons Attribution License, which permits unrestricted use, distribution, and reproduction in any medium, provided the original work is properly cited. The aim of this study is to prepare a model for the production of Newcastle disease virus (NDV) lentogenic F strain using cell culture in bioreactor for live attenuated vaccine preparation. In this study, firstly we investigated the growth of Vero cells in several culture media. The maximum cell number was yielded by culture of Vero cells in Dulbecco’s Modified Eagle Medium (DMEM) which was 1.93 × 106 cells/ml. Secondly Vero cells were grown in two-litre stirred tank bioreactor by using several commercial microcarriers. We achieved the maximum cell concentration about 7.95 × 105 cells/ml when using Cytodex 1. Later we produced Newcastle Disease virus in stirred tank bioreactor based on the design developed using Taguchi L4 method. Results reveal that higher multiplicity of infection (MOI) and size of cell inoculums can yield higher virus titer. Finally, virus samples were purified using high-speed centrifugation based on 3** (3-1) Fractional Factorial Design. Statistical analysis showed that the maximum virus titer can be achieved at virus sample concentration of 58.45% (v/v), centrifugation speed of 13729 rpm, and centrifugation time of 4 hours. As a conclusion, high yield of virus titer could be achieved through optimization of cell culture in bioreactor and separation by high-speed centrifugation. phosphoprotein (P), matrix (M) protein, fusion (F) protein, hemagglutinin-neuraminidase (HN) protein, and an RNA directed RNA polymerase (L) in the 3′ to 5′ direction . NDV isolates display a spectrum of virulence in chickens, from a fatal to an inapparent infection . Strains of NDV are classified into three major pathotypes, depending on the severity of disease produced in chickens. Lentogenic strains do not usually cause disease in adult chickens and are widely used as live vaccines in poultry industries in the United States and other countries. Viruses of intermediate virulence that cause respiratory disease are termed mesogenic, while virulent viruses that cause high mortality are termed as velogenic . chicken eggs. NDV is harvested from the allantoic fluid and processed to create a vaccine. However, this procedure has the disadvantages of being labour-intensive, time consuming and requires large area for the incubation of eggs. Cell cultures on the other hand are more convenient and less expensive than eggs and also convenient to examine microscopically for evidence of viral proliferation. However the current titers of NDV propagated in cell cultures are usually lower than those obtained in embryonated eggs. Nevertheless, some manufacturers still find it economically feasible to use the more mechanized cell culture methodology for producing inactivated ND vaccines . Mechanism to produce NDV vaccine is keep diagnosed and updated time by time to improve the production. Cell substrate systems that have been identified to be able to produce NDV are Vero (African Green Monkey), CEF (chicken embryonic fibroblasts), and DF-1 (continuous cell line derived from CEF) [4, 9, 10]. These cells are anchorage dependent where they require surface of a matrix to facilitate cell growth. Microcarrier technology which was introduced by Van Wezel for culturing anchorage-dependent cells in suspension is easily applied in stirred tank bioreactors; it is scalable, and it is able to produce high number of cells per volume ratio . Microcarrier cell culture system offers many advantages over conventional flasks or bottle cultures in growing anchorage-dependent cells and has been used for the industrial manufacture of polio, rubella, rabies, influenza, and foot-and-mouth disease (FMD) vaccines [12– 15]. This work addresses the production of F strain of NDV in cultured Vero cells. To achieve high virus titer we have determined the most suitable culture media and microcarrier which are able to yield the highest cell number. Later we investigated the effect of different sizes of cell inoculum, serum concentrations during virus growth phase, and multiplicity of infection (MOI) on the virus titer. We have also optimized the operating condition for purifying NDV using high-speed centrifugation method. All these results constitute valuable information on the development of a large-scale microcarrier cell culture process for producing NDV vaccine. 2.1. Cell Line. Vero cells obtained from the Veterinary Research Institute (Ipoh, Malaysia) were used in this study. 2.2. Virus Strain. Lentogenic F strain of NDV adapted to grow in Vero cells and provided by Universiti Putra Malaysia (Selangor, Malaysia) was used throughout the study. obtained from Amersham Biosciences (Uppsala, Sweden). Hillex and Plustic Plus microcarriers were obtained from SoloHill (Michigan, USA). All other chemicals were obtained from Sigma (St. Louis, USA). 2.4. Microcarrier Preparation. Cytodex 1, Cytodex 3, Hillex, and Plustic Plus microcarriers were prepared and sterilized according to manufacturer’s instructions. For Cytodex 1 and Cytodex 3, the microcarriers were swollen with Ca2+, Mg2+- free PBS twice and autoclaved at 115◦C for 15 minutes while for Hillex and Plustic Plus microcarriers, they were washed with deionized water and autoclaved at 121◦C for 30 minutes. All microcarriers were washed and incubated with culture media prior to use. 2.5.Growth in Static Culture. Verocellsweregrowninserum containing medium as described by Freshney . 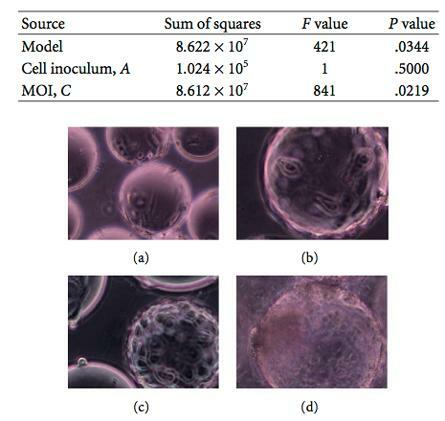 Static cultures of cells were carried out under these conditions: a seeding density of 1×105 cells/cm2, temperature of 37◦C, and 5% concentration of CO2 . 2.6. Bioreactor Cultures. Cultures were performed in a 1.5 L bioreactor (Infors HT, Switzerland) with one-litre working volume and equipped with an elephant ear impeller. For starting the microcarrier cultures, the cells were detached from T-flasks using Accutase enzyme and incubated in the reactor in the presence of the microcarriers. The culture was seeded with 5 × 104 cells/mL and was continuously agitated at 70rpm. The starting volume was equal to 1L. During cell culture proliferation phase, the following conditions were applied: pH set at 7.2 (regulated by injec- tion of CO2 and addition of 1 M HCL and 1 M NaOH), pO2 maintained at 30% air-saturation by injecting air when required, temperature at 37◦C, and agitation rate at 70 rpm. For NDV production phase, pH was maintained at 7.4, pO2 at 30% air-saturation, agitation rate at 100rpm, and temperature at 37◦C. Once cell density reached maximum, cells were washed with PBS. Later cells were infected with NDV according to the designed levels by inoculation of virus in DMEM supplemented with trypsin. After 1 hour of cell infection, more DMEM was added until the working volume reaches one litre and the stirring was restarted. Samples were taken daily to determine the following factor: cell con- centration, cell viability, and virus titer. Cell concentration was counted by counting cell released after trypsinization . where X represents the viable cell density per mL, and t the time points of sampling expressed in hours; n and n − 1 stand for two succeeding sampling points. 2.8. High-Speed Centrifugation. Harvested virus sample was diluted using phosphate buffer saline (PBS) into three different concentrations: 25%, 50%, and 100% (v/v). About 1.8 g of Polyethylene Glycol 600 (PEG) was added into 40 mL of each virus sample and stirred in a sealed centrifuge tube at 4◦C for 4 hours. After 4 hours, samples were centrifuged at 4◦C at designed speed and time. After that the pellet for each sample was resuspended in 0.4 mL PBS and transferred into a centrifuge tube. The suspended pellet was later sonicated for 30 seconds until aggregates were disrupted. The debris was then spinned out at 14 000 rpm for 10 minutes. HA test was performed to determine the final titer. 2.9. Haemagglutination Assay (HA) Test. The haemagglutination assay (HA) method described by Grimes  was used. Using a 96-well V-shaped microtiter plate, 50 μl PBS was added from wells 2A–12A. One hundred microlitres of virus sample was added to well 1A to which 50 μl of it was serially diluted up to well 11A. Fifty microlitres of 1% red blood cell (RBC) was added to all wells. Agglutination of RBC was observed in wells containing the virus while clumping of RBC was seen in wells containing no virus. Dilution of the last well showing agglutination gave the titer of the virus sample. Haemagglutination units were multiplied by 20 and, therefore, expressed per mL as HAU/mL. 2.10. TCID50 Assay. Fifty percent tissue culture infectious dose (TCID50) assay was carried out in 96-well flat shaped microtiter plates. Plates were seeded with Vero cells such that confluence was reached in 2-3 days. Vero cells were grown in DMEM media containing 10% FBS and grown at 37◦C, 5% CO2. Appropriate dilutions of each virus were prepared in DMEM medium and 100 μl of each dilution was added to each well. Plates were incubated at 37◦ C for 30–60 min before 100 μL of DMEM was added to each well. The plates were then incubated for 4 days until the CPE effect was appeared. The log TCID50/mL calculation was based on the Reed and Muench  formula. 2.11.Taguchi’s Orthogonal Design. TaguchiL4 array was used to design NDV production in bioreactor experiments. Three factors that were chosen to be manipulated in four runs of experiment are size of cell inoculums, serum concentration during virus production phase, and multiplicity of infection, MOI. 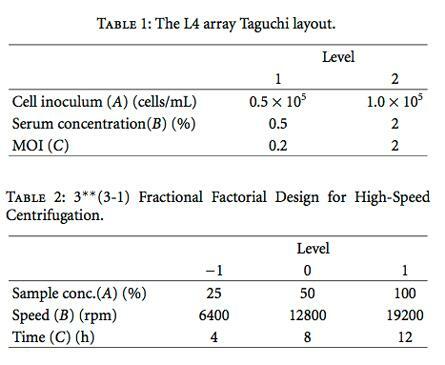 The levels of the factors studied and the layout of the L4 Taguchi’s orthogonal array are shown in Table 1. 2.12. Fractional Factorial Design. 3**(3-1) Fractional Factorial Design was used to assist high-speed centrifugation experiments. Three factors that were chosen to be manipu- lated in nine runs of experiment are sample concentration, speed, and time. The levels of the factors studied and the layout of the fractional factorial design are shown in Table 2. 3.1. Selecting Culture Media for Growth of Vero Cells. Four different culture media, MEM, DMEM, L-15, and RPMI 1640, have been used to culture Vero cells in T-flasks in order to determine which medium has the capability to yield the maximum cell concentration. As shown in Figure 1, culture of Vero cells in DMEM has generated the maximum cell concentration which was 1.93 × 106 cells/mL. This is followed by culture of Vero cells in Leibovitz’s L-15 media which has yielded 1.5 × 106 cells/mL, MEM (1.42 × 106 cells/mL), and RPMI (7.55 × 105 cells/mL). Growth of Vero cells in DMEM was in lag phase from 0 h until 40 h. Starting from 40 h, the culture entered exponential phase and reached the maximum cell concentration at 56 h. Once reached the maximum, cell concentration dropped continuously until the end of the culture. 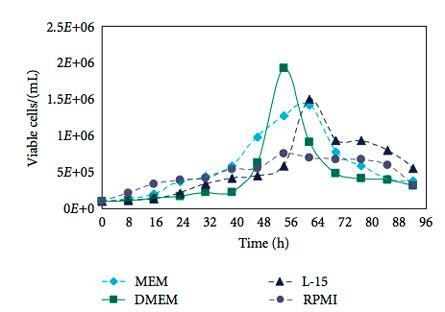 From growth kinetic aspect, again culture of Vero cells in DMEM had achieved the best result where the specific growth rate μx and doubling time td recorded were 0.052h−1 and 13.11 hours. This is followed by L-15 with μx of 0.042 h−1 and td of 16.38 hours, MEM (μx = 0.041 and td = 16.72 h), and RPMI (μx = 0.036 and td = 19.20 h). Based on these results, DMEM was selected to be used in further stages of the study because it has the best performance in terms of maximum cell concentration yielded and also growth kinetic. DMEM has more glucose and glutamine concentration than any other medium does thereby sustaining the growth of cells for a longer period. Glucose and glutamine are the most vital nutrients in media providing carbon and nitrogen source, respectively, thus vital for cellular metabolism . In addition, DMEM is also reported as able to support the growth of cells to much higher densities compared to many other culture media because the concentrations of certain essential amino acids and vitamins are several fold greater in DMEM than in the other media. Figure 1: Comparison of Vero cell growth in four different culture media. All media were supplemented with 10% fetal bovine serum (FBS). Figure 2: Comparison of Vero cell growth on different types of microcarrier in a 2 L stirred tank bioreactor. of microcarrier can best support the growth of Vero cells in a nonstatic culture. Four types of commercial microcarriers that were selected for this purpose were Cytodex 1, Cytodex 3, Hillex, and Plastic Plus (PP). Figure 2 shows the growth profile of Vero cells on all types of microcarrier. From the fig- ure it can be seen that the growth of Vero cells on Cytodex 1 microcarrier yielded the maximum cell concentration which was 7.95 × 105 cells/mL. This is followed by culture of Vero cells on Cytodex 3 which has yielded 7.40 × 105 cells/mL, Hillex (1.05 × 105 cells/mL), and Plastic Plus (PP) (1.00 × 105 cells/mL). Cell attachment on each type of microcarrier could be clearly observed by microscopic examination as shown in Figures 3(a)–3(d). Figure 3: Cell attachment of Vero cells on four different microcarri- ers viewed under inverted light microscope at magnification of 20x: (a) Cytodex 1; (b) Cytodex 3; (c) Hillex; (d) Plastic Plus (PP). time, the differences compared to Cytodex 1 microcarriers were not significant as compared to the other two types of microcarriers. Therefore Cytodex 1 can be regarded as the optimum for supporting cell growth and was selected to be used in later stages of the study. Both Cytodex 1 and Cytodex 3 microcarriers pro- duced by Amersham Biosciences are made from dextran while Hillex and Plastic Plus (PP) microcarriers which are produced by SoloHill Inc. are made from polystyrene material. Dextran is a degradable material that allows cells to be harvested easier compared to polystyrene which is a nondegradable material . This fact may partially explain for lower cell concentration obtained when using Hillex and Plastic Plus (PP) polystyrene microcarriers compared to both Cytodex microcarriers. Another observation was the concentration of micro- carrier used. In this study, Cytodex 1 and 3 microcarriers were used at a concentration of 3g/l while Hillex and Plastic Plus (PP) microcarriers were used at 14g/l and 20 g/l, respectively, as recommended by the manufacturers. Mendonc ̧a and Pereira  and Julien  reported that high concentrations of microcarriers in bioreactor culture reduced the ability of cells to attach due to increased shear stress emanating from collisions between microcarriers. 3.3. Vero Cell Culture in Bioreactor for NDV Production. To optimize production of NDV in the bioreactor, the effects of the following three factors have been investigated: cell inoculum size (factor A), serum concentration during virus replication phase (factor B), and multiplicity of infection, MOI (factor C). These factors were manipulated in four runs of experiment that was designed using Taguchi L4 model. 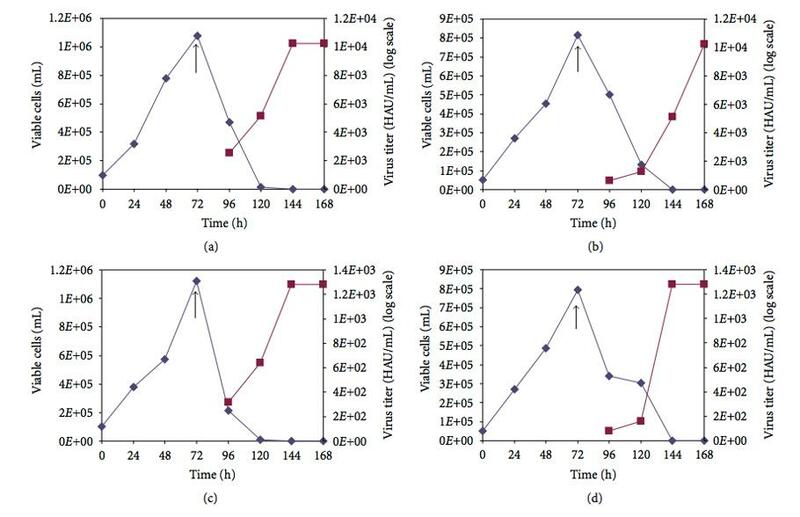 Figure 4: Growth of Vero cells on Cytodex 1 microcarrier and production of NDV: (a) cell inoculums: 1.0 × 105 cells/mL, serum concentration: 0.5%, MOI: 2.0; (b) cell inoculums: 0.5 × 105 cells/mL, serum concentration: 2.0%, MOI: 2.0; (c) cell inoculums: 1.0 × 105 cells/mL, serum concentration: 2.0%, MOI: 0.2; (d) cell inoculums: 0.5×105 cells/mL, serum concentration: 0.5%, MOI: 0.2. (↑) indicates cell infection. until the end of the culture period. 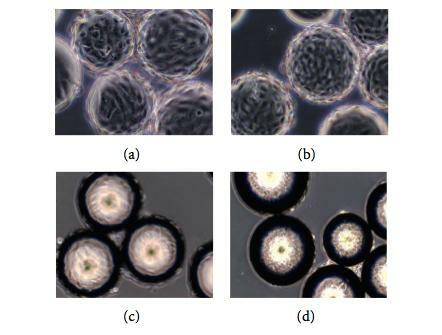 Figure 5(a)–5(d) shows the microscopic examination of Vero’s cell growth before and after NDV infection in 2-litre stirred tank bioreactor. Table 3 shows the maximum HA titer and maximum infectivity titer obtained for each run conducted according to the L4 Taguchi array. The lowest virus yields were reached during Run 4. In these conditions, maximum HA titer achieved was 640HAU/mL. On the other hand, the maximum HA titer was achieved during Run 1 and Run 2 and was equal to 10240 HAU/mL. Run 1 also achieved the maximum infectivity titer which was 4.79 × 107 tcid50/mL. where the NDV production as yield (Y) is a function of cell inoculum (A) and multiplicity of infection, MOI (C). Table 4: Analysis of variance (ANOVA) for Taguchi L4 model. 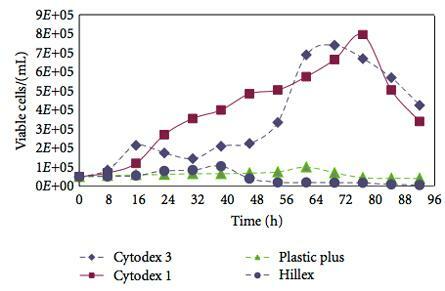 Figure 5: Monitoring of Cytodex 1 microcarriers during cell growth and NDV production phases of Vero cells grown in a 2 L bioreactor. Cells were observed with an inverted light microscope without staining: (a) day 0, (b) day 2, (c) day 3, and (d) 2 day post infection. the experimental and predicted values is better when the value of R is closer to 1. In this experiment, the values of R and R2 were 0.999 and 0.998, respectively, for the NDV production. These indicates high degree of correlation between the experimental and the predicted values. The value of R2 indicates that 99.8% of the factors size of cell inoculum and multipilicity of infection contribute very positively to the response. The value of R2 is also a measure of fit of the model and it can be mentioned that only about 0.2% of the total variations were not explained by NDV yield. The value of the adjusted determination of coefficient was also very high (99.64%) which indicates a high significance of the model. 3.4. High-Speed Centrifugation. Harvested virus samples were purified using high-speed centrifugation method. To optimize the purification, the effects of the following three factors have been investigated: sample concentration (factor A), centrifugation speed (factor B), and centrifugation time (factor C). These factors were manipulated in nine runs of experiment that was designed using 3**(3-1) Fractional Factorial design. Table 5 shows the result of all nine runs of experiment. Among all runs, the maximum virus titer was achieved during Run 6 where the maximum virus titer produced was 5120HAU/mL. The results also reveal that centrifugation speed of 6400 rpm always yielded the lowest virus titer. This suggests that this speed is not sufficient for the virus to settle down. 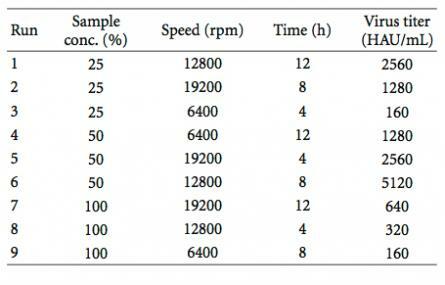 Table 5: Result for high-speed centrifugation. Table 6: Analysis of variance (ANOVA) for 3** (3-1) Fractional Factorial model. where the NDV titer produced as yield (Y) is a function of sample concentration (A), centrifugation speed (B), and centrifugation time (C). Correlation coefficient R and the determination coeffi- cient R2 obtained in this experiment are 0.9586 and 0.9189, respectively. Value of R that is close to 1 indicates that the correlation between the experimental values of this experiment with the predicted values is high. The software also deduced that the maximum NDV titer can be produced when the sample concentration is 58.45%, centrifugation speed is 13729.03 rpm, and centrifugation time is 8.51 hours. stood out as the best substrate for cells to adhere and grow in nonstatic culture. From analysis using statistical software like Design Expert and Statistica, it has been found that NDV production in 2 L stirred tank bioreactor can be improved when size of cell inoculums and MOI is increased. Also it has been analyzed that the optimum conditions to purify NDV using high-speed centrifugation are sample concentration of 58.45%, centrifugation speed of 13729.03 rpm, and centrifugation time of 8.51 hours. This work was funded by the Ministry of Science, Technology and Innovation of Malaysia under Grant ABI-A21. The authors wish to thank Mr. Kamaruddin from Universiti Putra Malaysia for providing the virus sample. D. F. Adene, “Country report on the management and health problems of rural poultry stock in Nigeria,” in Proceedings of the Centre for Tropical Agriculture (CTA) Seminar on Small Holder Rural Poultry Production, pp. 175–182, Thessaloniki, Greece, October 1990. Z. Huang, S. Krishnamurthy, A. Panda, and S. K. Samal, “Newcastle disease virus V protein is associated with viral pathogenesis and functions as an alpha interferon antagonist,” Journal of Virology, vol. 77, no. 16, pp. 8676–8685, 2003. D. J. Alexander, “Newcastle disease and other avian paramyx- oviridae infections,” in Diseases of Poultry, Y. M. Saif, H. J. Barnes, J. R. Glisson, A. M. Fadly, L. R. McDougald, and D. E. Swayne, Eds., pp. 63–87, Iowa State University Press, 11th edition, 2003. O. De Leeuw and B. Peeters, “Complete nucleotide sequence of Newcastle disease virus: evidence for the existence of a new genus within the subfamily Paramyxovirinae,” Journal of General Virology, vol. 80, no. 1, pp. 131–136, 1999. B. S. Seal, D. J. King, and H. S. Sellers, “The avian response to Newcastle disease virus,” Developmental and Comparative Immunology, vol. 24, no. 2-3, pp. 257–268, 2000. OIE, Office International des Epizooties/World Organization for animal Health, “Newcastle disease,” in Manual of Standards for Diagnostic Tests and Vaccines, 2000, http://www.oie.int/eng/normes/mmanual/A 00036.htm. D. J. Alexander, “Paramyxoviridae: infection and immunity,” in Encyclopedia of Immunology, I. M. Roit and P. J. Wes, Eds., vol. 3, pp. 1203–1205, London Academic Pres, London, UK, 1992. G. E. Gallili and D. Ben-Nathan, “Newcastle disease vaccines,” Biotechnology Advances, vol. 16, no. 2, pp. 343–366, 1998. J. M. DiNapoli, L. Yang, A. Suguitan Jr., et al., “Immunization of primates with a newcastle disease virus-vectored vaccine via the respiratory tract induces a high titer of serum neutralizing antibodies against highly pathogenic avian influenza virus,” Journal of Virology, vol. 81, no. 21, pp. 11560–11568, 2007. P. V. Ravindra, A. K. Tiwari, B. Ratta, et al., “Induction of apoptosis in Vero cells by Newcastle disease virus requires viral replication, de-novo protein synthesis and caspase activation,” Virus Research, vol. 133, no. 2, pp. 285–290, 2008. A. L. Van Wezel, “Growth of cell-strains and primary cells on micro-carriers in homogeneous culture,” Nature, vol. 216, no. 5110, pp. 64–65, 1967. A. L. van Wezel, C. A. van der Velden-de Groot, and J. A. van Herwaarden, “The production of inactivated poliovaccine on serially cultivated kidney cells from captive-bred monkeys,” Developments in Biological Standardization, vol. 46, pp. 151– 158, 1980. B. Meignier, H. Mougeot, and H. Favre, “Foot and mouth disease virus production on microcarrier-grown cells,” Developments in Biological Standardization, vol. 46, pp. 249–256, 1980. K. Trabelsi, S. Rourou, H. Loukil, S. Majoul, and H. Kallel, “Comparison of various culture modes for the production of rabies virus by Vero cells grown on microcarriers in a 2-l bioreactor,” Enzyme and Microbial Technology, vol. 36, no. 4, pp. 514–519, 2005. P. van Hemert, D. G. Kilburn, and A. L. van Wezel, “Homogeneous cultivation of animal cells for the production of virus and virus products,” Biotechnology and Bioengineering, vol. 11, no. 5, pp. 875–885, 1969. R. I. Freshney, Culture of Animal Cells: A Manual of Basic Technique, John Wiley & Sons, Glasgow, UK, 4th edition, 2000. Pharmacia: Microcarrier Cell Culture and Method, Pharmacia LKB Technology, Uppsala, Sweden, 1991. W. Scheirer and O. W. Merten, “Instrumentation of animal cell culture reactors,” in Animal Cell Bioreactors, C. S. Ho and D. I. C. Wang, Eds., pp. 405–443, Butterworth-Heinemann, Boston, Mass, USA, 1991. S. E. Grimes, A Basic Laboratory Manual for the Small Scale Production and Testing of I-2 Newcastle Disease Vaccine, Food and Agricultural Organization (FAO), Animal Production and Health Commission for Asia and the Pacific (APHCA), 2002. L. J. Reed and H. Muench, “A simple method for estimating 50% endpoints,” American Journal of Hygiene, vol. 27, pp. 493– 497, 1932. ECACC, European Collection of Cell Cultures, Fundamental Techniques in Cell Culture: A Laboratory Handbook, Sigma Aldrich, 2001. B.L.Seal,T.C.Otero,andA.Panitch,“Polymericbiomaterials for tissue and organ regeneration,” Materials Science and Engineering, vol. 34, no. 4-5, pp. 147–230, 2001. R. Z. Mendonc ̧a and C. A. Pereira, “Cell metabolism and medium perfusion in VERO cell cultures on microcarriers in a bioreactor,” Bioprocess Engineering, vol. 18, no. 3, pp. 213–218, 1998. J. Julien, “Hydrodynamics, mass transfer and rheological studies of Gibberellic acid production in a stirred tank bioreactor,” World Journal of Microbial Biotechnology, vol. 23, pp. 615–623, 2003.